Next March will mark the 57th anniversary of Anne Frank’s death. Branded an illegal alien of the occupied Netherlands because she was Jewish; she and her young friends had to hide in fear of the black-shirted fiends known as the Protective Squad (Schutzstaffel) or SS as it was commonly called. Roaming through neighborhoods they were the enforcers of ethnic purification. Their unspeakable atrocities against human beings in the name of the law still lacerate our sense of humanity. And while the ends of their sickening purposes still surface occasionally in places like the Sudan, Rwanda and Bosnia; their means continue to be used as weapons against targeted peoples like today’s Department of Homeland Security thugs. In Los Angeles, a young girl, 15 years of age (the same as Anne Frank when she died in the camps from typhus), is knocked to the floor, terrorized and forever scarred by fear as Federal Immigration and Custom Enforcement (ICE) agents, dressed in black, wearing helmets of steel and thick plastic, their bodies encased in leather and metal, looking like robo cops, bust in the door of her home, brandishing shotguns and automatic weapons. Bleeding, sobbing hysterically, (like millions of Jewish children in the dark times, when the world ignored the government’s technique of national law enforcement); she watches as her father is beaten to the ground, hand-cuffed and shoved through the front-door. Her mother, screaming, crying, is tackled by big men, drug by her hair as she struggles to get near her horror stricken daughter. Child services takes her into “custody;” her parents are off to be concentrated in camps. For the crime of attempting to secure a decent life for their daughter; they will be branded as criminals against the state, threats to “the fatherland’s (homeland) security,” and deported. In Grand Island, Nebraska, a single-mother, working at the Swift packing plant, in obvious pain from the plastic cuffs, screams to the crowd as she is pushed toward waiting ICE police buses with whited-out windows, for someone to please pick up her daughter from school. Meanwhile, a school bus driver, later that day, has to drop two toddlers off at a church because their parents were seized and failed to pick them up at the bus stop. Forty-one workers were seized at the S&S Bakery, more than half its employees. Whole families were snatched in subsequent home invasions. At a November 3rd community forum, sponsored by the American Friends Service Committee, a Quaker group, three young Latina students tearfully recounted how their parents were taken and the effect on their families. Some employees had worked at the bakery for 9 years and their children are legal citizens who must now face life without financial support. Also supporting the forum, where workers and family members testified to their plight was the San Diego Raza Rights Coalition who sponsored the dialogue “to demonstrate our solidarity with the families and to deepen our understanding of the government’s strategy that represses workers right to work.” The theme of the forum was “working is not a crime, it is a right.” Bags and boxes of groceries, diapers and paper goods were collected at the meeting; while the AFSC calls on the community at-large to continue to donate food and money to these beleaguered families. Meanwhile, over 300 San Diegans joined a rally in support of immigrant families in City Heights November 5th. Two-thirds of those protesting were young people and half of those were teenagers, revealing how these targeted raids are radicalizing a whole generation of Latinos. Most of the youthful speakers, bellowing through a mega-phone, not only called for the ICE raids to stop but called for amnesty. Maria Ayala, of San Diego Pro People Youth, announced that the rally in City Heights was ironic, “this gentrified community used to be our community.” A member of the Filipina organization, Affirm, announced that “if any one is good enough to work here, they are good enough to stay here.” Enrique de la Cruz, of the San Diego Zapatista Collectivo, spoke of the need to change the entire economic model, “for a few people to be rich, a whole lot of us have to be poor.” Calling the workplace invasions “racist raids,” members of San Diego State’s Students for Solidarity with Palestine, spoke in solidarity those victimized the U.S.’s war on immigrants. Others student groups called for an immediate moratorium on all raids, deportations, incarcerations and the separation of families. While he mentioned the “deep roots of anti-Mexican racism,” Akers suggested that the police state persecution of immigrants was more about “a means of controlling people.” He pointed out that immigrant workers are the fastest growing segment of union efforts in the country and that most ICE raids have occurred at factories and packing facilities that are in the process of being unionized. Five of the six Swift & Company meat packing plants raided, netting over 1,300 workers, were represented by the United Food and Commercial Workers Union (UFCW). The sixth was in the process of becoming unionized. While the use of Federal troops for union busting goes back to the 19th Century in the U.S. it has never occurred on such a scale or as part of an over-all specific strategy against a minority group by powerful interests. Across the board from the militarized nature of law enforcement to the courts; an actual conspiracy against labor exists, not just migrant workers. Injunctions against the raids are routinely turned down, while union lawyers are denied access to arrested workers. Beginning in 1942, a similar program recruited temporary immigrants who were exploited, cheated and deported if they tried to organize a union, go on strike or advocate for decent wages or living conditions. Like China’s rural slave labor, transported to the city to live in squalid conditions and work in dangerous environments, the “Bracero” program allowed employers to drive down wages against U.S. workers, and was finally ended in 1964 after Ceasar Chavez and other Latino organizers fought it. As researchers for Project Censored announced in a 2008 study, “the demand for undocumentated labor in the US economy is structural.” With the de-unionization of the workplace and heavy emphasis on subcontracting, which shields large employers against worker protections and responsibilities, immigrant workers have become a necessary component of US competitiveness in a world market. Carlos Pelayo, a local organizer for the United Domestic Workers of America, spoke of the efforts of corporate employers to create a two-tier caste system, where millions of people are denied decent wages, social benefits and fundamental rights. He urged community residents to begin thinking beyond “ethnicity” to a general worker consciousness. Another community meeting is scheduled November 16th to support the rights of immigrants. Under the banner of “stop the raids and repression in our communities” the City Heights gathering will be at the Activist Center, 4246 Wightman St. The human rights get together will focus on three areas. (1) Education and information – organizing “know your rights” events in City heights and other places ICE regularly harass immigrants. (2) Community defense – the formation of a local defense committee to be called the Comites de Defensa del Barrio in City Heights and (3) to discuss the organizational structure of Puente Arizona and their people’s assemblies and defense committees. Now that the “war on terror” has become a “war on immigrants” all people of conscience need to step forward and support amnesty. Herding people into concentration camps, separating and destroying families, shipping people off to countries they have never known or speak the language, making the workplace a place of fear and intrigue, these are issues the family and friends of Anne Frank faced during the nightmare of fascism, lets not let it happen in the United States or our children will be stained by our lack of moral authority and compassion. This is an important issue, in Ocean Beach as well, for those businesses that employ workers who could face deportation. This is a dividing issue between the left and the right, for those who perceive social justice beginning with the right to work and live free from oppression. The interesting thing? Look at the racial makeup of BP agents. A very large percentage of them are Hispanic themselves. I don’t personally know any so I won’t make any assumptions or accusations about what kind of people they are. I just have to wonder what goes through their mind (those who are of Hispanic decent). I wonder if any of them are the offspring of undocumented immigrants. Of course they are, or their grandparents were. First, the author does not seem to understand, the thugs in the story are union workers. ICE agents belong to the AFGE. The American Federation of Government Employees (AFGE) is the largest federal employee union representing 600,000 federal and D.C. government workers nationwide and overseas. How is calling federal union workers, thugs, the SS, robo cops, union busters, and the Gestapo fair to these employees? Can we use these same terms for workers from the IRS, FBI, and, ATF? Most ICE raids target felons and most Hispanic felons target their own community. Finally, comparing what the Jews went though after detection and capture to the current lawful deportations is absurd. The authors lack of understanding of this Jewish history makes this a poor attempt to defend his radical ideas. RB- Come on. You have chosen to define ICE as union workers? Give me a break. Have you ever worked somewhere and were a union member?? ICE works for our government, for us. They may also belong to their union. To characterize their actions as directed by the union is not only wrong, it is a damned lie. I expect more from you RB. The author attacks the workers in the article not the department or the laws. No law enforcement workers deserves these characterizations. This attack is like attacking the troops because of the current war policies, IMO. I did not mean to say the union directed these policies. I have been in a union, I have been a federal worker . RB- I read this article as an indictment of the department and its laws. Thank you for clarifying that the union did not direct these policies. As far as your statement about ICE personnel being union workers — should we find out if the Gestsapo and the SS were unionized, to see if it’s proper to criticize or not criticize? I know, comparing the plight of the undocummented in the US to that of Jews during the Nazi years is a bit extreme, but the comparisons are not lost. Racist scapegoating is a tactic that has been used throughout history. Anne Franke was born a citizen of the country she was resident in, and broke no laws in establishing her residency. And the forces that were “branding” her (in your words) as an “illegal alien” were the illegal OCCUPIERS of the “occupied Netherlands”. In that sense – and it’s a very real one – the individuals you seem to be seeking sympathy for are more like the Nazi thugs portrayed as harassing Anne Franke than creatures to pity. They are occupying our (referring to the citizens) country illegally, and expropriating resources that they didn’t earn and don’t belong to them. 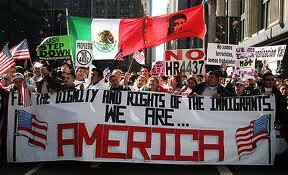 The fact is they KNOWINGLY broke this country’s laws and have, in essence, come to ILLEGALLY occupy it. They knew – or should have known – the possible consequences of doing so, including being “raided”, having their hands cuffed behind their backs, etc. Of course, they could have avoided those consequences entirely by obeying the law. Now no doubt “immigrants” of the unlawful variety may want a better lifestyle, etc….but I don’t see where that gives them a right to steal and/or destroy the patrimony of others. Instead, it seems to me that real justice demands that they be treated as what they are; lawbreakers. And, if justice was truly being served, there would be more ICE raids instead of less. This comment which borders on being a racist rant was approved so that someone, like me, could respond to some of the points. * You aren’t going to tell me that up till now, all immigrants that came into this country over the last couple of hundred years came here “legally”?? How did your forebears get here? And oh BTW, did they – your forebears – steal any Indian land from the Indians illegally? Another ridiculous claim by you. * The fact is that US factories, fields, and oh HomeDepots need these laborers. And everytime there is a recession in this country, Mexican immigrants become the big scapegoats and there’s a huge outcry for their deportations; and then when things get better, our industries and corporate farms need them again, and we find ways to bring ’em back. The border is a giant spigot. When things are good – it’s on; when bad, it’s turned off. * You call for more not less raids is extremely dispassionate. Again if theren’t jobs Mexicans and other Central Americans would not be risking their lives to cross an increasingly dangerous border and high seas. In the end, go read some history and do some soul-searching Ken. Out of curiosity, why is it borderline racist to suggest that illegal immigrants are here illegally? Wouldn’t someone here from France overstaying their visa also be in the same position? That’s not racist, it’s simply the law. Is it also unfair to characterize the article as widely insulting to compare the rounding up of Jews and killing them to arresting illegal immigrants and putting them in handcuffs? I can’t be alone in thinking that this comparison is beyond the pale. And yes, both sets of my grandparents came here legally, checking into Ellis Island. No, we didn’t take over half of France. We took over half of Mexico. It’s not simply a matter of someone “overstaying their visa” when you’re discussing a whole people. It was not just one comment that made the entire thing bordering on racist – it was the tone, the insinuations, etc. – like comparing the Nazi thugs to undocumented workers, J. And no, it’s not unfair to make that comparison. It’s perhaps somewhat of a stretch. But not unreasonable, and certainly, not unfair. You are so fortunate to have grandparents who came here “legally.” Do you think most Europeans did that – came here “legally”? What would native Americans say to that? Sorry, but with all due respect, comparing the arrest of illegal immigrants to the systematic and brutal murdering of millions of Jews is unreasonable and pretty outrageous. To me, that’s pretty much a conversation-ender. I’m out. Dear J: I agree, the comparison is a bit over the top. However, the ideology of scapegoating “the other” for the country’s problems, and using “illegal aliens” for political gain, is pretty much in line with the racist, right wing ideology that the Nazis perfected, and our junior stormptroopers are increasingly responding to. The majority of “illegal aliens” make more concrete contributions to our society than race-obsessed people like you. With each impotent, profanity-laced epithet, each perverse sexual insult you leave in this forum, you shame your forefathers. You are at the bottom of a rather mediocre class insult hurlers. Ian, it’s not clear who you are responding to here. Could you clarify, please. My comment about the insult hurling was responding to Ryan (who went off on you). Yeah, okay, thanks. Too much. Don’t you people know how to read? Rocky said, right up front, he was comparing the MEANS not the ENDS of the Nazi atrocities. Of course, there is no comparison between the death camps and today’s U.S.’s war on immigrants. Rocky wanted to point out that similiar actions by ICE put us on that slipperly sloap…. It is a slippery slope to allow anyone to violate the laws that the rest of the citizens and other legal immigrants are required to obey. 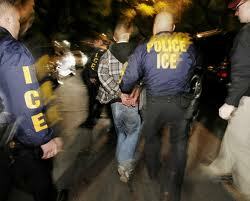 ICE agents should enforce immigration law without regards to the country of origin. Older Article: Who is cutting down the trees at the Ft. Rosecrans cemetery? Vern April 24, 2019 at 11:17 am on Congress Must Begin Impeachment Proceedings – to Protect the Constitution and the Rest of UsDespite all that has gone on, is going on, and will go on, Trump remains an imbecile.